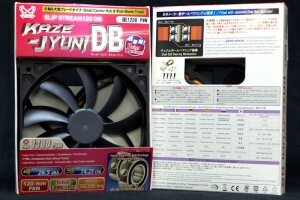 Scythe has unleashed a half dozen of their dual ball bearing Slip Stream 120DB fans on an unsuspecting world. They look just like the old Slip Stream fans of yore, keeping the narrow fan hubs to maximize airflow. Are they worthy successors? Let’s find out. Scythe is a company right from the Akihabara Electric Town in Tokyo. They make lots of retail-ready products, packaged to hang on a wall. These fans are no exception. Scythe fans have always arrived in plastic bags. According to Scythe, “The plastic bag is simply to keep the plastic fan case free from scratch and dust.” Strip off the bag, and the clear plastic box is wall-ready. 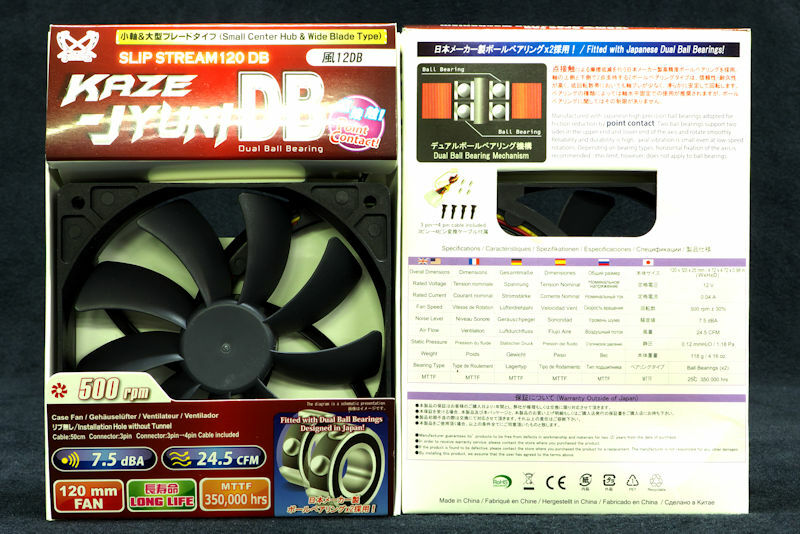 Slip Stream 120DB fans come in brightly colored boxes that are color-coded for their contents. On the outside are the specs and the contents – in six languages. Not a speck wasted. One additional note: the labels on the fan are color-coded and match the colors on the boxes. Yes, it’s a tiny detail. But it’s a nice touch. 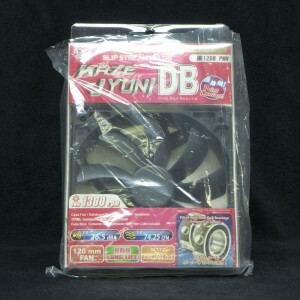 All Slip Stream 120DB fans come with a bundle of accessories. 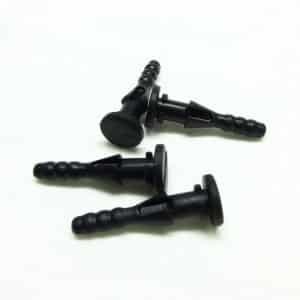 Included are a set of four standard fan screws. In addition, each box has a set of rubber vibration isolators. The PWM fans come with a Molex to 3-pin adapter. 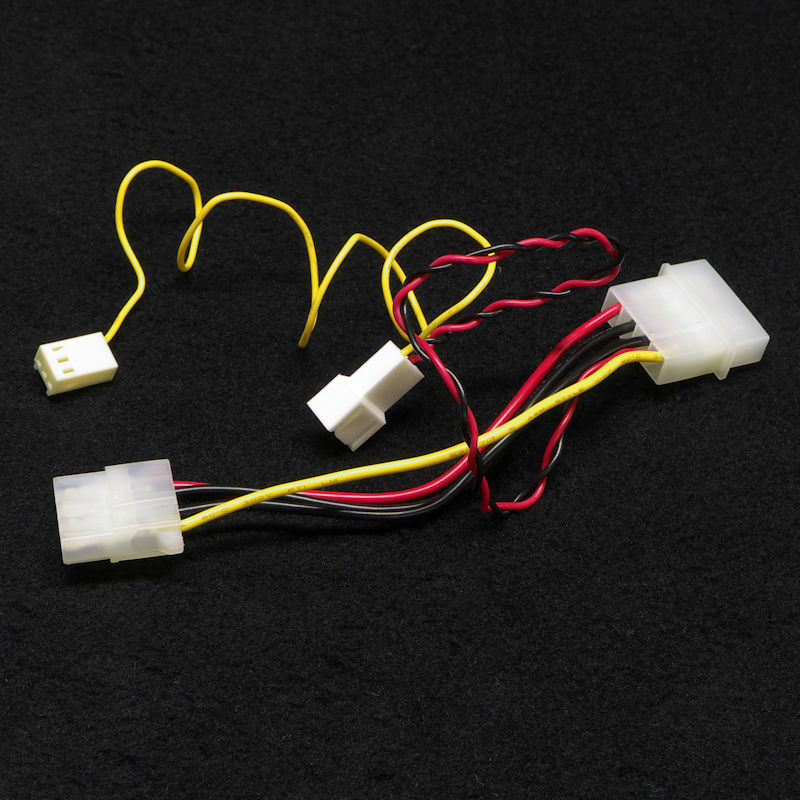 The voltage-controlled fans come with Molex adapters, but have sockets for three-wire fans as well as a yellow RPM-reporting wire that leads to a plug. 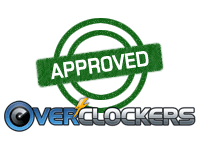 The end will plug into a 3-wire or 4-wire header on your motherboard and tell it how fast your fan is going. This is as great little accessory. I have used these little adapters for all sorts of things over the years. It is very nice to see that Scythe is continuing to include these versatile adapters with their fans. 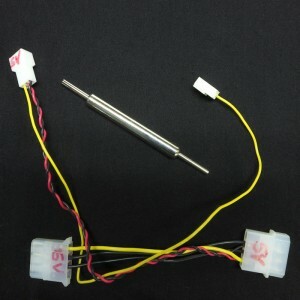 The adapter for the PWM fan does not include the RPM line. 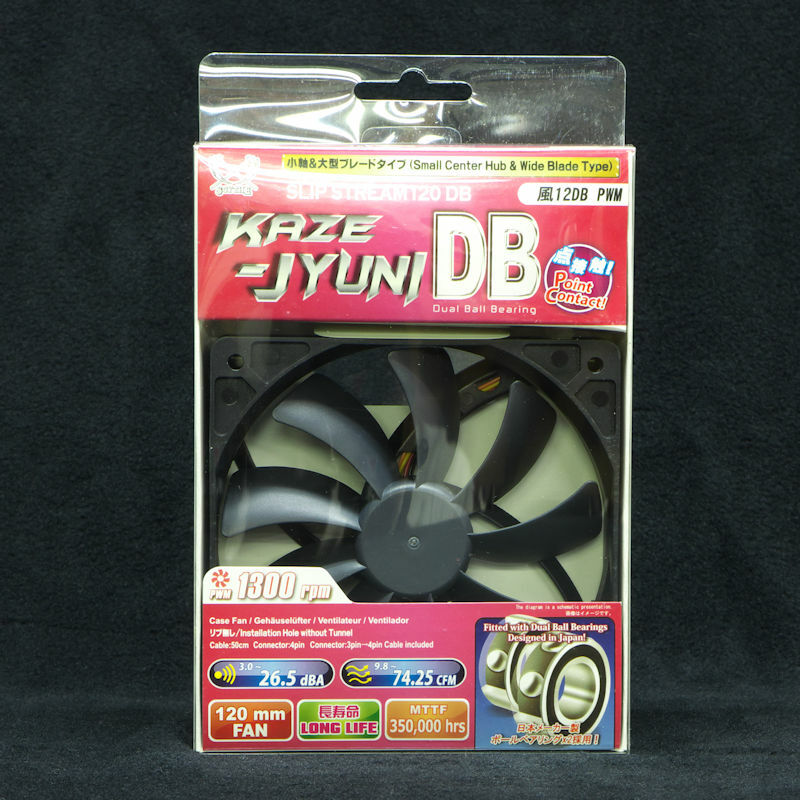 These double ball bearing fans have specs are comparable to the original Slip Stream fans, plus or minus the obligatory 10%. But those older Slip Streams had sleeve bearings. And now you can find the static pressure of these new fans, something that was not available for the old Slip Stream fans. The Slip Streams, old and new, are not supposed to have high static pressures. They are the quintessential case fan. 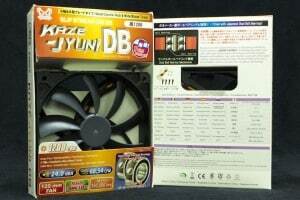 Yet the old Slip Stream PWM fans were included with Scythe heatsinks, where they turned in a more than competent performance in helping keep things cool. The ambient noise for this testing was 30 dBA. To measure noise levels that were softer than that, the sound pressure level was measured 10 cm from each fan. The sound pressure level was adjusted to 1 meter by subtracting 20 dB. The sound pressure meter was a Tenma 72-942. This fan tester has a microphone that is not accurate under 30 dBA. 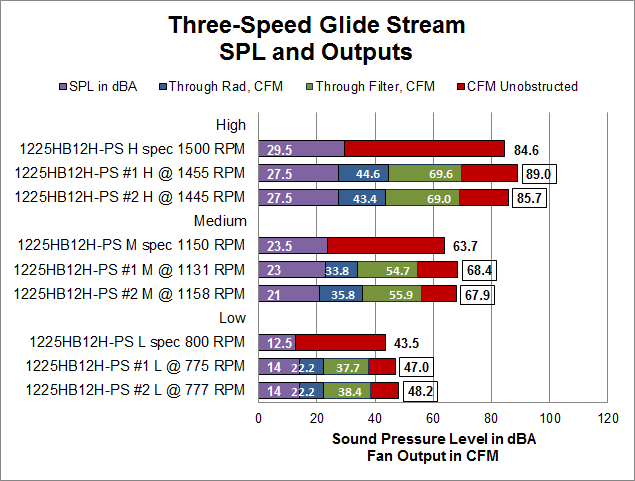 That means an adjusted measurement of 10 – 15 dBA is not accurate; the fan could easily be quieter than that. But this is the limit of all but the most expensive SPL meters. To measure the fan’s output, the fan was placed in a box that allows the airflow to mix. The outflow was then measured in CFM by an Extech AN100 anemometer, which averaged 10 readings per run. 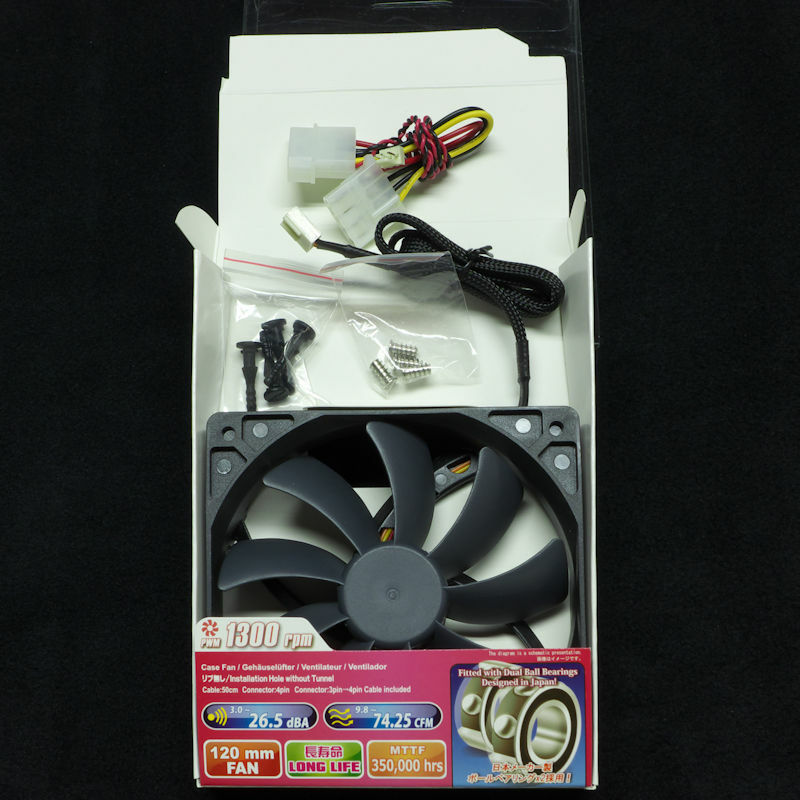 Each fan was run in free air to collect its free-air RPM and the free-air sound pressure level. Each fan was put through its paces: they pushed through a 30 FPI radiator. They pulled through a wire mesh dust filter. Finally, their unobstructed output was measured. The Glide Stream looks like a fancy Slip Stream (see it in action here). It was included as a comparison fan. 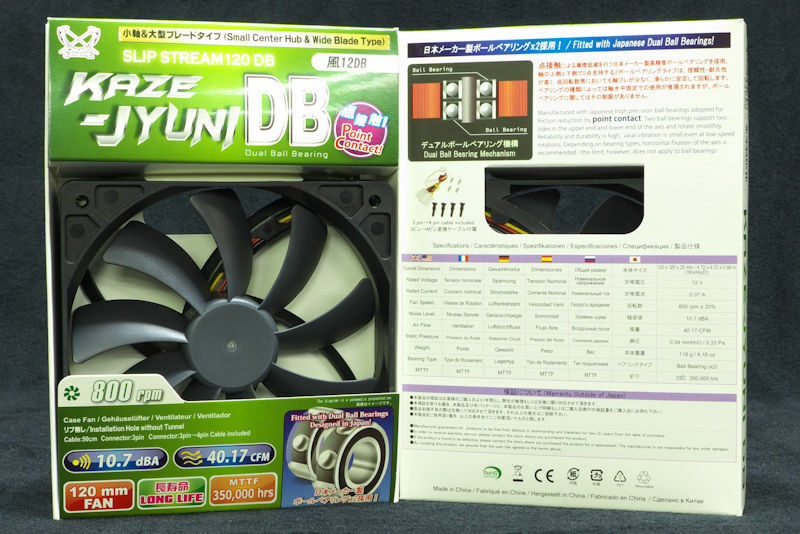 Also included for comparison are the original Slip Stream fans. We will see how the new fans measure up to their predecessors. 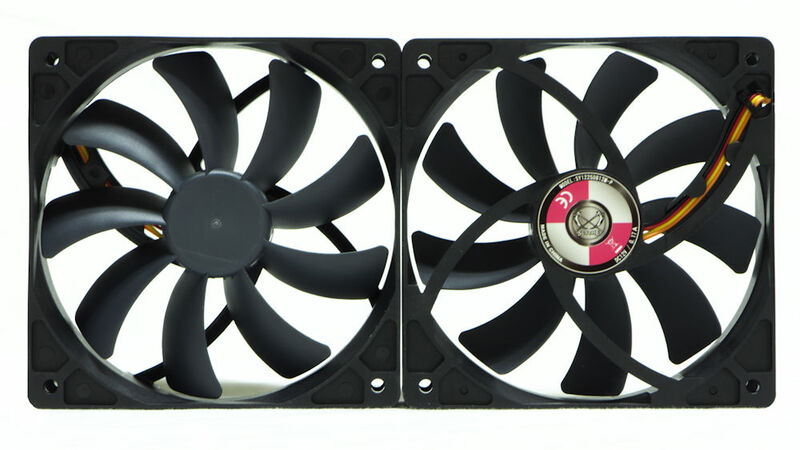 Scythe provided pairs of Glide Stream and Slip Stream 120DB fans for testing. We will look at individual fans, in part because you can begin to get a feel for manufacturing variation and in part because averaging hides the variation. 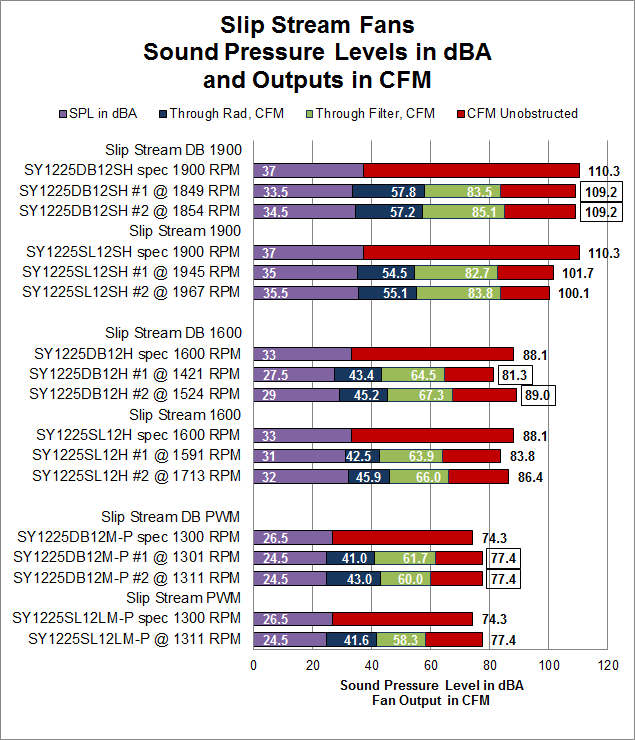 The results from the 500 RPM Slip Streams are presented in a stacked bar chart because the sound pressure level in dBA is larger than the airflow through the rad measured in CFM. The results for the other Slip streams are presented in superimposed bar charts. In all of the charts, the top represents the specifications of the fan, and below that are the actual results. Stand by for a series of four complex charts. 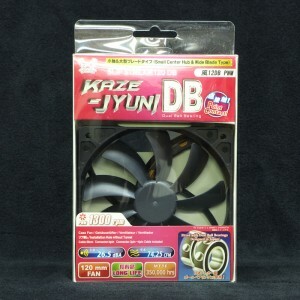 With the first, we have the higher speed Slip Stream DB fans compared with their sleeve bearing predecessors. 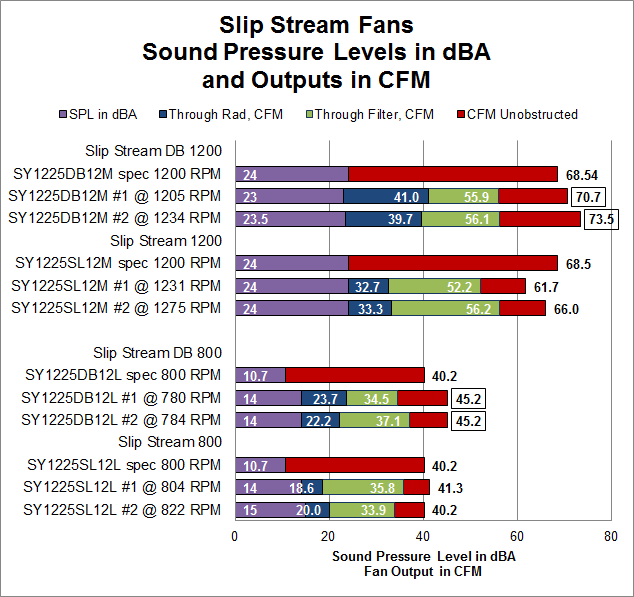 The Slip Stream 120DB’s not only matched their specs (sometimes requiring that plus-minus 10%) but they pushed a surprising amount of air through the rad. 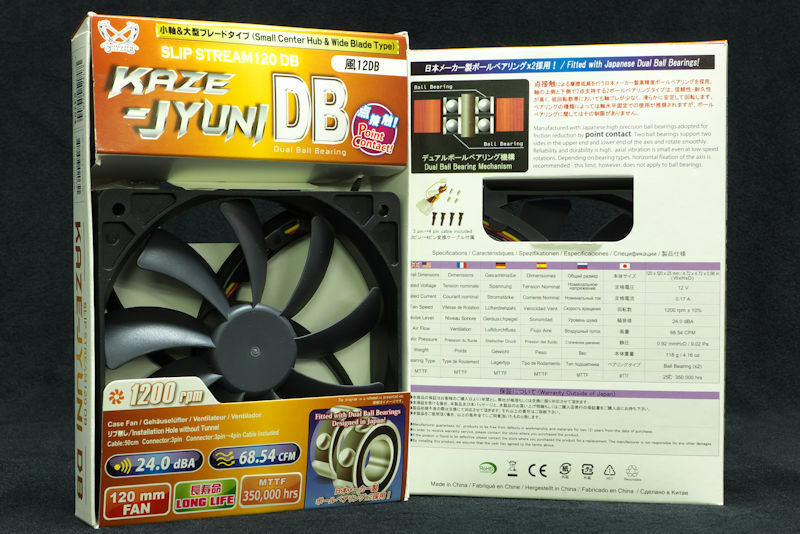 For our next trick, we will look at the medium speed Slip Stream 120DB fans. Watch out, though. The horizontal scale had to be stretched a little here. 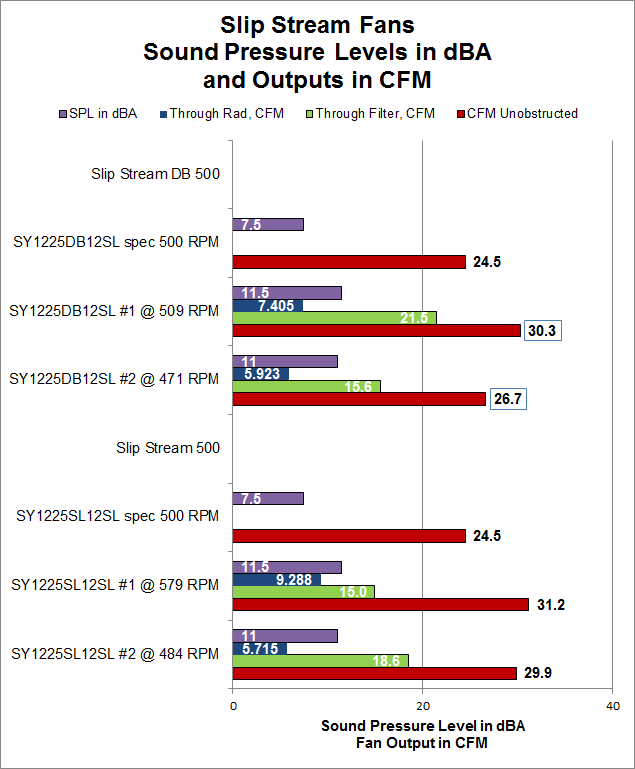 The next chart shows the 500 RPM Slip Stream and Slip Stream 120DB. Because these fans have such a low output to begin with, they of course have a very low output when they push through the radiator. So, as promised above, we have a stacked bar chart instead of a superimposed bar chart. And the horizontal axis was stretched once again. Note those dBA results: 11.5 and 11.0 dBA. Those represent readings of 31.5 and 31.0 dBA at 10 cm. Since the ambient ran 31 dBA (this sounds like silence to our ears) that means these fans could just barely be heard close up. You had to have a good imagination to think you heard them at 4 inches. Inside your rig, you will not hear them at all. Finally, we have the three-speed Glide Stream. This is the fan you find in the Ninja 4, which was recently reviewed here. Each of the three speeds was tested on each of the fans, through the rad, through the filter, and without obstruction. All through the testing, I listened for bearing noise. You can hear it in some ball bearing fans, The dry scratching sound of the bearing race, the rattling of the balls you can sometimes hear if the bearings are a trifle loose. I heard none of that with the Slip Stream 120DB fans. Maybe you will hear them with your own ears. If so, you are special. But I could hear no bearing sounds and the Slip Stream 120DB fans did not click. We’re not done. Your power supply unit (PSU) supplies 5 Volts as well as 12 Volts. The Molex connector of your PSU contains wires for both. 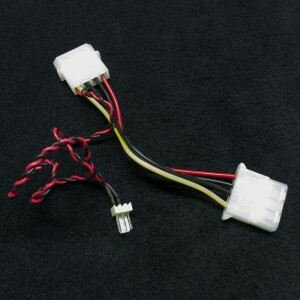 The Scythe adapter makes it easy to transfer to 12 Volt line to the 5 Volt position, getting 5 Volts supplied to a fan. All you need is a Molex pin tool. The picture below shows a modified Scythe adapter, along with the tool you need to perform the modifications. 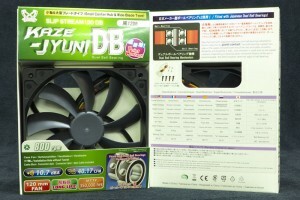 Note that the RPM of the fan is reported to the motherboard. By the way, you can begin to see just how versatile these Scythe adapters are. 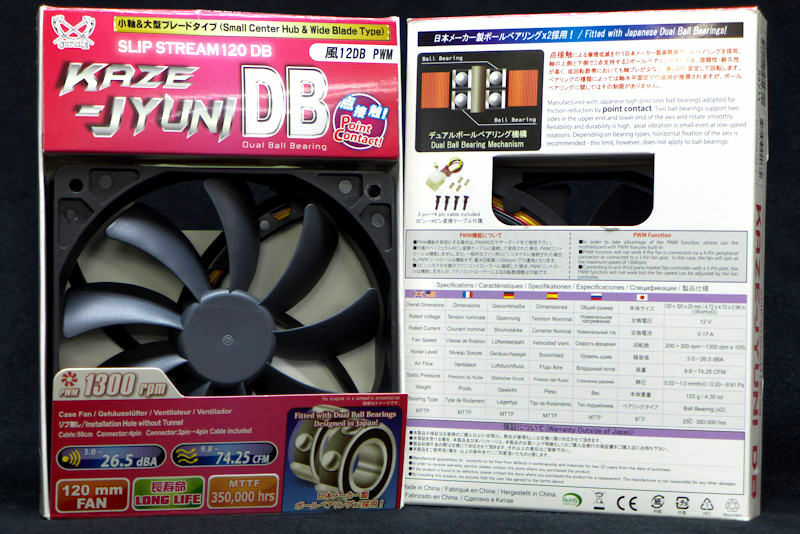 As you can see, the fastest and slowest Slip Stream 120DB fans would not run at 5 Volts. In between, though, the fans ran even more quietly than before. 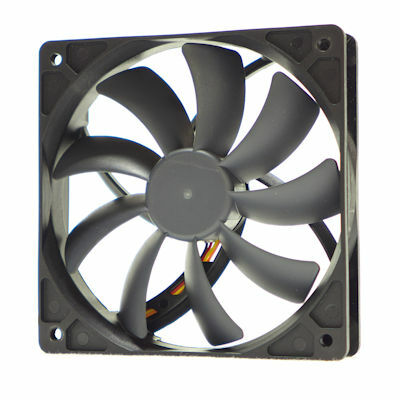 It is hard to find a Voltage-controlled fan that runs below 400 RPM. Why would you want such a fan? Because they make literally no noise, even close up. 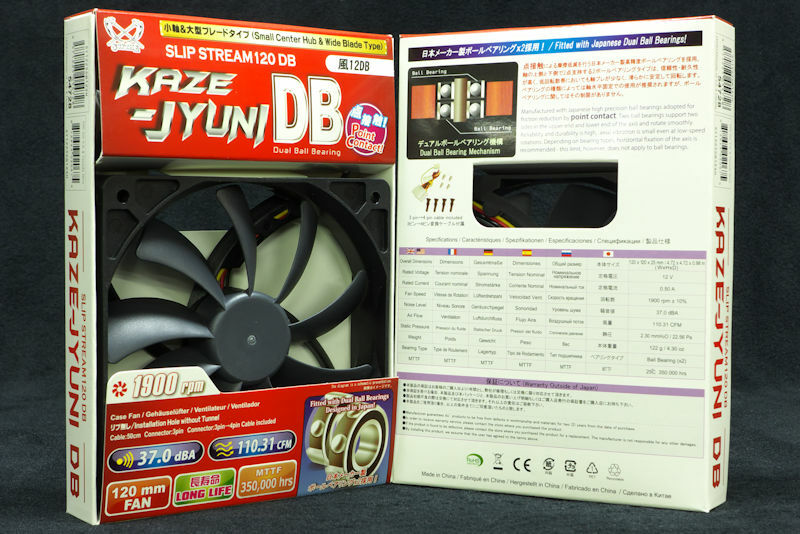 The Slip Stream 120DB fans performed about the same as the old Slip Stream fans, within manufacturing variance. Further, the specs are accurate. The only complaint about the old Slip Stream fans was the bearings. Some people reported consistent bad luck with the old sleeve bearing fans. Of course, people reported that they had good luck with the old fans. 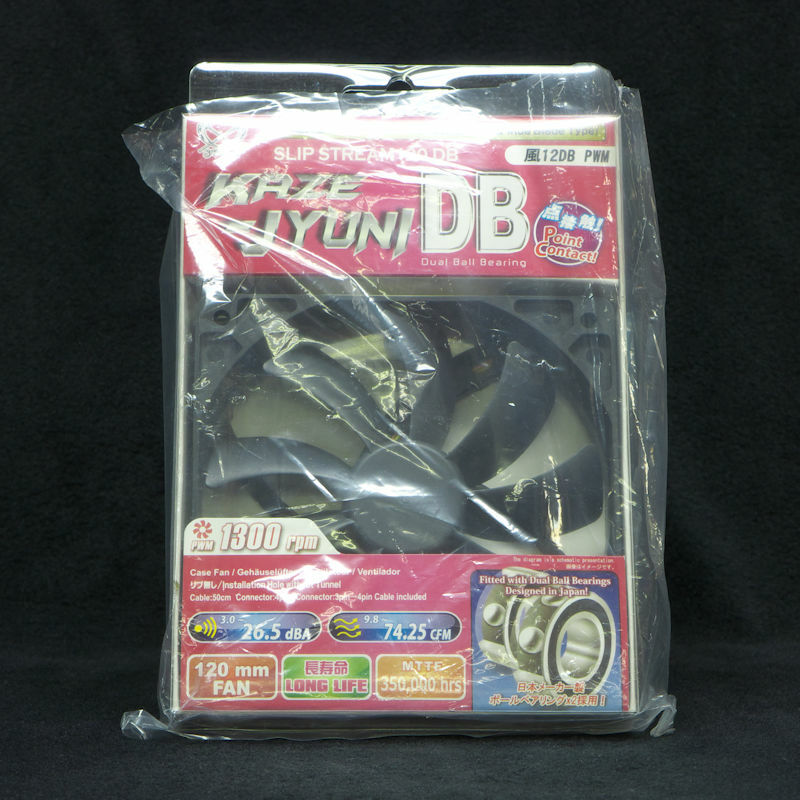 But all in all, these fans mark an improvement: you can trust ball bearing fans. And the Slip Stream line now sports double ball bearings. Actually, they sport quiet or silent ball bearings. And their circuitry does not click. But these fans are not silent. Simple physics requires that when air is moved, it makes noise. You could hear that, but all fans make that noise. 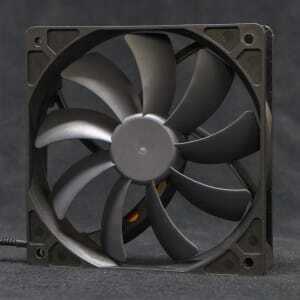 Not only can you trust these fans on your heatsink, you can festoon your case with them. The voltage-controlled Slip Stream 120DB comes with Scythe’s delightful Molex adapter. Not only can you power your fans with 12 Volts directly from your PSU, the adapter allows you to report the speed to your motherboard. All fans vibrate, a little or a lot. Scythe includes some vibration isolators in their accessories. A nice touch, this will keep your case quieter. Remember, these fans focus on moving air. They do not concentrate on static pressure. The fact that they can move air through obstructions is an unexpected bonus. Why does Scythe continue to offer 500 RPM fans? They offered 500 RPM Slip Streams. 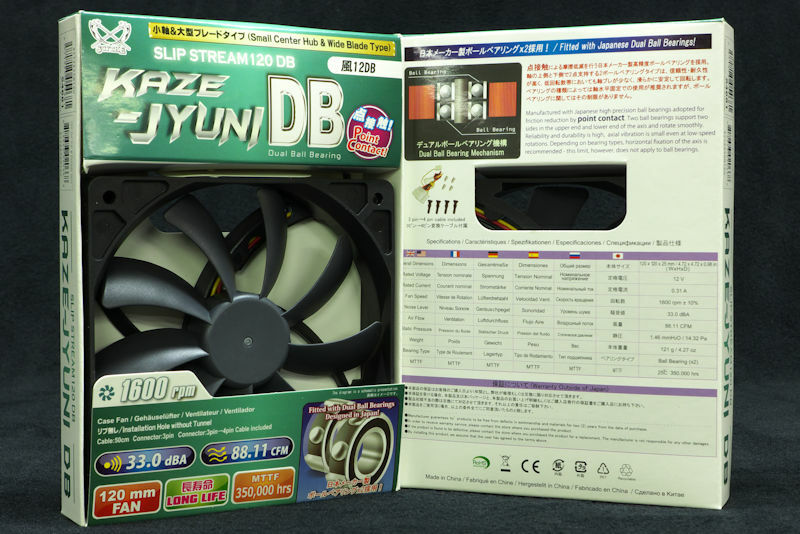 They offered 500 RPM Slip Stream II (140 mm) fans, both original and upgraded. They offered 500 RPM Gentle Typhoons. 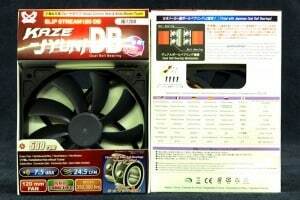 They now offer Slip Stream 120DB fans. I have not asked them this question, but consider: the 500 RPM fans are very quiet fans. You almost can’t hear them with your ear right up to them. 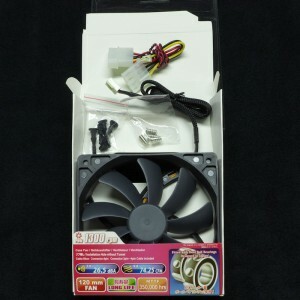 You can get a passive PSU and put one of these fans on it, and never worry if your PSU is getting enough airflow to cool its circuits, even if the fan is blowing upward. With the ball bearings in the Slip Stream 120DB fans, you never worry about orientation. The fan can handle it. If you have a fanless GPU you can now strap a 500 RPM Slip Stream 120DB on it, blowing upward, and never worry about orientation. If you have a passive CPU heatsink, you can attach one of these and never worry about longevity. And you can do all of this and maintain a silent system. That’s what 500 RPM fans are good for. As for why Scythe offers them, count it our good fortune. Thanks Ed. Nice write up. I've been looking at the Glide Streams lately, now will be considering the Slip Streams as well. Just remember that the Glide Streams represent the Old Scythe. They are sleeve bearings. They are probably good sleeve bearings -- Scythe is good at that -- but still sleeve bearings, and I would use them for cases. Now that we have ball bearing Slip Streams, you can use them anywhere, including heatsinks. OO, nice write-up ehume :thup: I'll be considering these for my next fan upgrade.